Wound left by Mount Fuji. September. 12, 2018 07:54. .
She grew up looking at Mount Fuji. It was only natural because the mountain was seen from her house, school, and even streets. 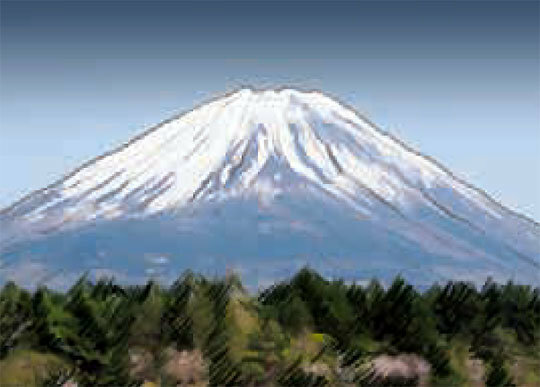 The sheer majesty of Mount Fuji aroused admiration and respect, but paradoxically, its commanding presence also made the mountain the “symbol of hatred.” Sometimes complaining about it, she grew up and matured in Mount Fuji’s wide arms. One day, however, the mountain started to look different. Once she began to see herself as Korean, Mount Fuji had become the “symbol of the Japanese imperialism and militarism that brutally invaded her homeland.” The generous, magnificent mountain turned into the “subject of denial and reject.” It greatly stirred her, leaving emotional wounds. She is Lee Yang-ji, Korean Japanese novelist who won the 100th Akutagawa Prize with her work “Yuhi” in 1988. Coming to Korea leaving Mount Fuji behind, she enthusiastically learned Korean language and culture, and became fascinated with Korean traditional musical instrument gayageum and traditional dance. However, the harder she tried to get rid herself of Mount Fuji and Japan represented by it, the more Yang felt the “sense of guilt that one may feel when talking behind someone’s back who has been kind.” While staying in Korea, she realized that Mount Fuji was holding a special place deep in her heart, and this made her confused. Yang’s novels including “Yuhi” were her confessions about such confusion. After much consideration, Yang came to a conclusion that she would no longer deny “Japan grained to her” and admit the fact as it is. Seventeen years after she left her hometown, Yang visited the neighborhood again. Mount Fuji was still there, in the same place as it was decades ago. The novelist was now able to appreciate the beauty of the mountain with tranquility. It took 17 years, and reconciliation with long-held disruptive, ambivalent emotions, for her to do so. The cure for wounds lied in the spirit of positivity that allowed people to accept themselves as they were.